One of the more important properties of electromagnetic waves is that they can be transmitted over almost unlimited distance. However, the same cannot be said of magnetic fields. “The impact of magnetism in science is limited by an apparently insurmountable restriction: magnetic fields rapidly decay with the distance from the sources,” say Carles Navau at the Autonomous University of Barcelona and a few pals. That looks set to change. These guys say they’ve discovered how to transmit magnetic fields over long distances using a ‘magnetic hose’. They’ve even demonstrated the technique for the first time with a proof of principle device. Researchers have attempted to transmit magnetic fields over short distances for many years. Transformers, for example, use ferromagnetic materials with a high permeability to transmit magnetic fields, but only over short distances because the field decays rapidly. But new materials offer an alternative approach. In recent years, physicists have begun to experiment with a new technologies that can manipulate electromagnetic fields with much greater flexibility. So-called “transformation optics” allows these fields to be bent, twisted and steered in ways that were impossible just a few years ago. 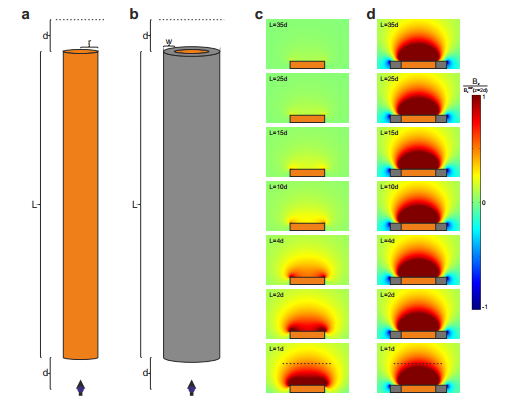 The trick is to create bespoke materials–metamaterials–that interact with the fields at a sub wavelength scale, guiding them in specific, predetermined ways. Navau and co point out that a static magnetic field can be thought of as a wave with an infinite wavelength so in theory it ought to be possible to control it with a metamaterial in the same way as electromagnetic waves. Part of their paper is devoted to exploring the properties of such a material and how it might be built. Their conclusion is that a “magnetic hose” consisting of concentric tubes of superconducting and ferromagnetic materials ought to do the trick. They say that a tube consisting of 20 concentric rings that is about ten times longer than it is wide, should transmit about 90 per cent of a magnetic field at one end to the other. Indeed, a tube of just 2 concentric rings should transmit about 75 per cent. These guys have tested this idea with a single superconducting tube 7 cm long (made of BiPbSrCaCuO) and filled with a ferromagnetic alloy (of cobalt and iron). During their experiment, they discovered that this tube was cracked about half way along its length, which allowed any magnetic field it transported to escape. They placed a coil at one of the tube that generated a magnetic field of 1.3 mTelsa. They then measured the field escaping from the crack as 0.8 mT. That’s significantly higher than the field without the hose. “The magnetic field has been guided through the [superconducting-ferromagnetic] magnetic hose from the coil source up to the crack point, where it escapes to the exterior of the hose,” say Navau and co. The ability to transmit magnetic fields over relatively long distances could have important applications. In particular, Navau and pals point out the potential in quantum information devices, where magnetic fields are crucial for manipulating quantum bits. “This could be particularly relevant in the context of nitrogen-vacancy color defect centers in a diamond nanocrystal, which have recently been identified as promising systems for the implementation of quantum information processors, or quantum repeaters,” they say. Exactly how they might build and control these magnetic hoses on this nanometre scale isn’t yet clear. But it’s not beyond the realms of possibility that these devices could become an important enabling technology for quantum information processing in future.